New Year’s diet resolutions need be neither a bore nor a chore with this immensely colorful dish! Recipe and photo by Susan L. Ebert. New Year’s diet resolutions need be neither a bore nor a chore with this immensely colorful dish that’s bound to lift any cowgirl out of the winter doldrums at the first eye-popping glance. It tastes even better than it looks and better still, it’s a super-easy supper after a day of chores, showy enough for guests, and is a complete meal in itself. Oh, and you’ll love my bomb-proof rice method, I’ll guan-durn-tee it: While this black rice takes an hour to bake—and is worth it for the dramatic color and sweet, nutty flavor—you can figure 45 minutes for brown rice or 30 minutes for white rice with the same measurements and preparations. Perfect every time! Prepare the rice: Preheat oven to 350° F. Spray the inside of an oven proof lidded pot with vegetable oil spray and place the rice, salt, and butter in the pot. Once the oven comes to temperature, pour 2 cups of boiling water (microwave or teakettle) over the rice, stir quickly with a fork, seal tightly with foil, and place the lid on the pot. Let cook in the oven for an hour. Remove from oven, fluff with a fork, discard the foil, and replace the lid until serving time. Prepare the grilled pineapple salsa: Preheat a grill or grill pan to medium-high. Brush both sides of the pineapple slices with 1 tablespoon of the grapeseed oil. Place the pineapple on the grill and cook, rotating the slices occasionally, until slightly softened and nicely marked by the grill, 2 to 3 minutes per side. Remove from the grill and allow to cool to room temperature. Dice 4 of the pineapple slices (discard the tough core portions) and place the dice in a medium nonreactive bowl; reserve the 5th slice for garnish. Add the red onion, bell pepper, white wine vinegar, jalapeños, lime juice, cilantro, and minced garlic to the diced pineapple. Drizzle with 1 tablespoon of the remaining grapeseed oil and toss gently to combine. Set the salsa aside to allow the flavors to marry. Prepare the ancho chile rub: Combine 3 tablespoons of the ancho chile powder, cinnamon, cumin, salt, brown sugar, and black pepper in a small bowl and mix to blend. Prepare the seafood: Season the salmon with the chile rub, and heat the remaining 2 tablespoons grapeseed oil to medium-high in a well-seasoned cast iron skillet. While the salmon rests, place a mound of rice on each plate. 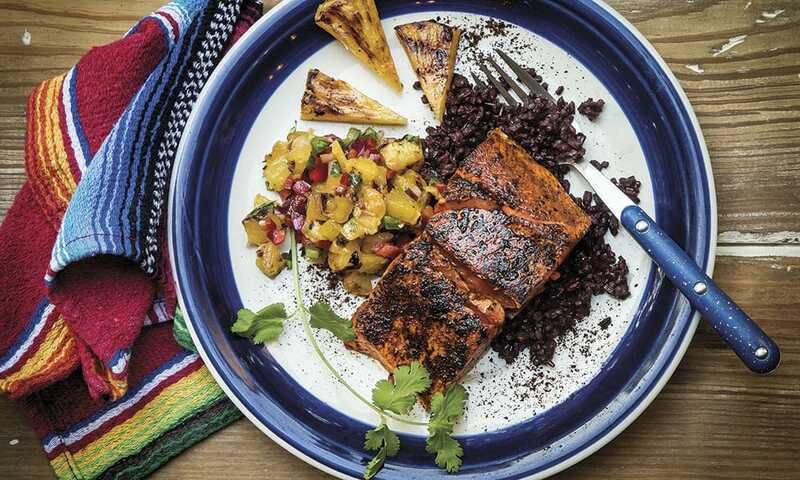 Place one piece of salmon atop each mound of rice, then plate the pineapple salsa. Garnish with cilantro sprigs, and the remaining grilled pineapple slice, cutting it first into fourths, and then each piece into thirds. Place 3 points on each plate. Lightly dust each plate with a sprinkle of the reserved ancho chile powder. Cook’s Note: Don’t confuse “chili powder” with “chile powder.” Chili powder is a commercial blend of ground chili peppers, cumin, salt, pepper, and other spices. Chile powder is simply ground chili peppers. To make ancho chile powder, split 3 to 4 dried ancho chilies from stem to tip and flatten out, discarding stems and seeds. Toast in a dry cast iron skillet over high heat, skin side up, constantly pressing down on them with a wooden spatula, until they are fragrant and brittle. Let cool, and grind in a spice mill (I use a repurposed coffee mill for this). Find this and more than 175 other organic wild game, seafood, foraged foods, and garden fare recipes in The Field to Table Cookbook by Susan L. Ebert (Welcome Books, 2016), available in the Cowgirl magazine store.